Instagram and Snapchat have set current trends on how we consume visual content, urging us to share amazing images and telling videos. If you want to make a big splash thru social media, you need to create high-quality images, infographics, presentations, videos, memes, etc. that will draw attention from your target audience. For a social media marketing campaign, posting text-based messages on social media is not the ideal way to share info instantly. Social media users have very short attention spans, and your potential customers are part of this group. If you do pursue text-based posts, then please avoid long sentences and blocks of paragraphs. The draggy job of reading thru all of that verbosity will alienate your audience. The Internet is already overloaded with textual content, so it’s best to convey the message as quickly as possible. Several studies have proven that people consume visual content thousands of times faster than textual content. Thus, it’s easier and faster for your customers to process visual presentations instead of reading blocks of text. Why not capitalize on it? You have to bring your brand in front of the consumers thru visuals, as the human brain has better recall of what it sees as opposed to what it reads. It may sound tedious if you craft images regularly, or unrealistic if you hire a graphic designer, for social media. But creating visual content doesn’t have to be mind-numbing and costly. We have gathered 5 free online tools (in no particular order) for you to create compelling visual content for social media. 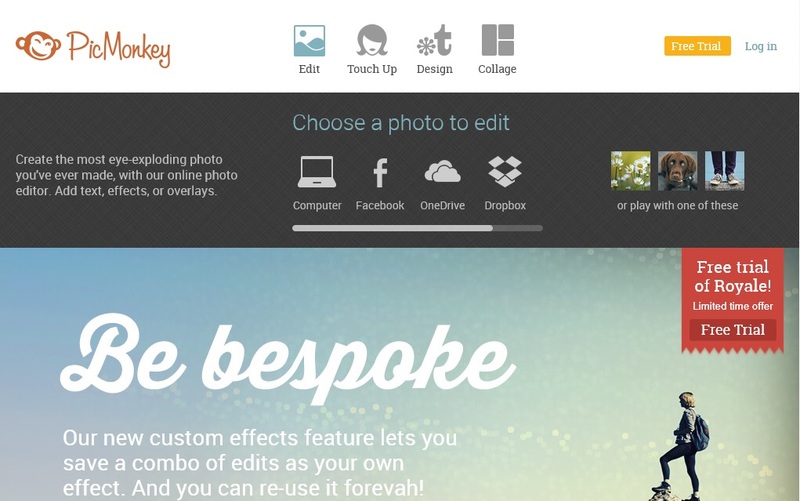 PicMonkey caters photo editing to those who find it cumbersome to use multiple tools. It’s an all-in-one editor that allows you to touch up a photo, make a design or make a collage. The editing features include resizing, cropping, adding special effects, and choosing frames, textures, overlays and font types. And you can even remove red eyes and whiten teeth. While the free online version offers basic features and costs nothing, the advanced PicMonkey Royale offers a whole lot more special effects when unlocked for a fee. If you want to try it out first, PicMonkey offers Royale for a one-week trial after you sign up. And a mobile app is in the works. Some users want to tinker around with images using more advanced tools. AutoDesk, the makers of AutoCAD, caters these features to you folks thru Pixlr Express and Pixlr Editor. Pixlr Express offers basic changes to embellish images and to add text, borders, stickers, overlays and special effects. While Pixlr Editor provides more advanced features compared to Express, it also gives you the option to add text and filters. If processing speed matters most for you, try Canva. From Facebook profile pics to Instagram posts, this online tool creates a range of beautiful designs in a jiffy. 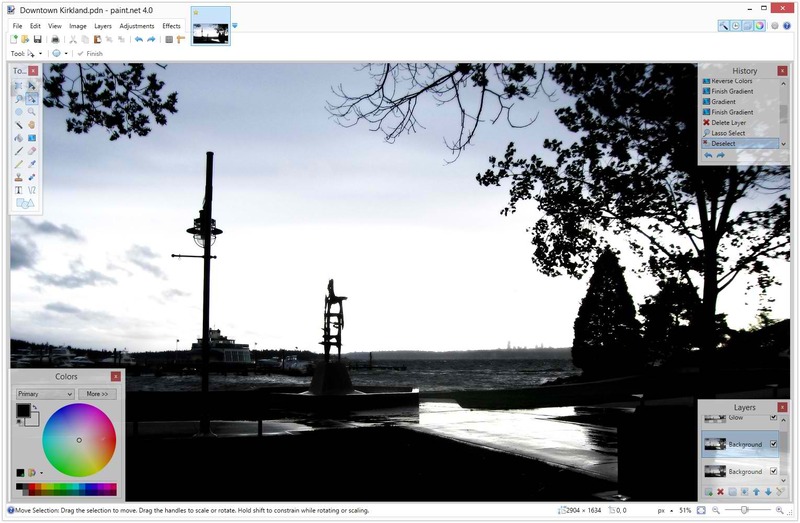 You can choose from preset designs, create an image from scratch or upload your own for editing. While it has an extensive collection of free images, you do have the option to purchase from its stock image library. Image creation or editing involves drag and drop, and you can download the finished product in your chosen format. Like PicMonkey, Canva’s online tool offers basic features for free, whereas the advanced features require an upgrade fee. If you want to create fun visual content for social media on the go, PicCollage is worth a shot. You can download this mobile app to your iOS or Android device from the Apple App Store or Google Play Store. Once installed, the app allows you to use images from your mobile device or Facebook account to create or design lively collages. PicCollage is free and will require you to use your creativity. The upside is adding a personal touch to visual content for your business. If the online tools above are not up to your liking, a great alternative to Adobe’s Photoshop is the best choice. While you have to download and install Paint.NET to take advantage of its features, it’s hard to miss it out of this list. The advanced image editor allows you to draw shapes, add text and special effects and create layers. If you’re looking for quick and easy tools to create visual content for social media, the ones in this list are definitely worth a try. And remember, while some of these tools offer read-to-use, royalty-free images, the best way to reach your target audience is to convey your brand’s image using your own custom designs. Got something to add? Drop us a comment below.